Chinese politics from the provinces: She's Got A Ticket To Ride. Not Really. In China, having a rail ticket doesn’t guarantee you’ll get to where you need to go. That was the case in Anhui province last week, when a Hefei primary school teacher stopped a high-speed train from departing the station on-time, by preventing the train door from closing to allow her tardy husband to get on board to join she and their daughter on a trip to Guangzhou. 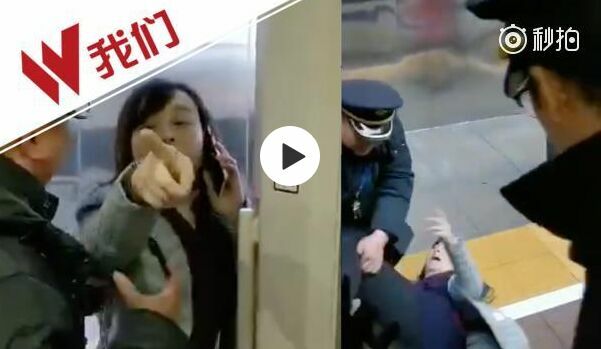 Train personnel tried to get the woman, Luo Haili [罗海丽], to either board the train with her daughter or remain on the platform so the train could depart, but she resisted. Her husband finally joined her and the family boarded, with the train leaving behind schedule, infuriating passengers and, according to various reports in Chinese media, causing delays on the crucial rail line between Hefei and Guangzhou. After being excoriated on social media, Luo was eventually identified by a video taken by one of the angry passengers. She was fined 2,000 RMB for interfering with train operations and, despite an apology the next day, suspended from her job pending an investigation by the local education bureau. But according to one commentator here in Nanjing, Luo isn’t the only one at fault. In an essay titled, “Don’t Punish One Person” [不该只罚一人], Song Guangyu [宋广玉] argued that others also bore responsibility for the incident. First, according to Song, there are the police officers on the train who didn’t force Luo to board or disembark. Moreover, Song argued, those who used the video to identify Luo and then posted her personal information on the Internet—so-called “human flesh search engines” [人肉罗]—“should not get off scot-free [不该逍遥法外].” They also should be subject to sanction of some sort. Song concluded that, since “everyone is equal before the law and rules must be equal, so must the responsibility for this incident not only stop with Luo.” Society itself isn’t responsible so much as those who are supposed to serve society, as well as those who think it’s their right to step in and do that themselves. They too must be held accountable. Meanwhile earlier this week, also in Anhui, Nanjing railway police investigators arrested a man manufacturing and selling counterfeit train tickets. Whether the buyers themselves will also be held responsible remains unclear. These sorts of efforts to subvert the system—the daily victories of greed over goodness, of personal gain at the expense of others—come in many forms here in China. Responsibility to one’s self only (and sometimes, one’s family) is the overriding ethos in China, and has been for ages. For every attempt by residents to be honest, polite, and generous, there are hundreds and often thousands of efforts in the other direction every day. Like Luo and Chen, offenders want to explain that what they’re doing is reasonable because they think can get away with it. Far too many do. But Luo didn’t: in the end, she got caught. Luo made her train, but she lost face--and probably her job too. Chen is likely to lose his freedom for a while, and perhaps his customers will get fined. Maybe that’s accountability, or perhaps it’s just another day in Anhui. With events such as these, it’s not clear whether China is speeding ahead or still stuck at the station. 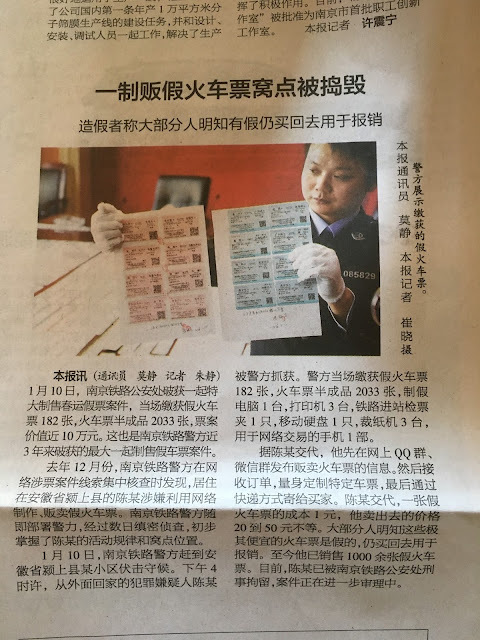 *Earlier this week, at least one train on the main Beijing-Shanghai rail route had audio announcements warning passengers not to purchase counterfeit rail tickets lest their social credit rating be affected.